In Pencak Silat we always assume the attack is unexpected. This seems like common sense but most martial artists train as if they will know when they will be attacked. There are 3 important things to take into account. Talking about awareness isn’t enough. You need to practice on a regular basis. Drills exercises and techniques to build this skill. The same way you build the physical skills of your art. We must assume that at some point our awareness will fail and we need to be ready. We have to assume we’ll be hit or stabbed before we realize we are under attack. This means we’ll need to train our body to respond automatically. So that as soon as an opponent makes contact our body relaxes and slides out of the way. Turning punches into grazes and stabs into ‘light’ slices. 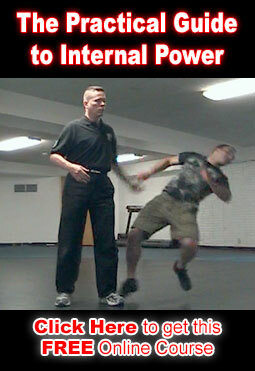 The Internal Combat Arts Course has several beginning drills for developing this skill. 2) Work from where you are. We must effectively respond to the attack first. This means training to move well from awkward and uncomfortable positions. Learning to strike with power at awkward angles. Learn to use the entire body. Every tool is useless in some situations and positions. You must have enough tools at your disposal that you are never out of options. The only weapons you can rely in are those already in your hands at the instant you are attacked. A person with a knife who is 20 feet away from you can stab you before you can draw a gun. This has been tested and proven over and over. …and that’s assuming you know the attacker is about to charge you. If you don’t know they are an attacker your reaction time will be even slower. The thing is attackers don’t tell you they’re an attacker. …and they certainly don’t announce it when they’re 30 feet away from you. So, we must assume we’ll be empty handed when we are attacked. And if we are training to draw a weapon we must train to draw in the middle of an altercation while we are already fighting. In Silat drawing a weapon is built into the empty handed movements of the art and the empty hand fighting movements are the same ones you use with a weapon. Last, train to use anything that might be in your hand already. Pen, Cell Phone, Purse or whatever. Our favorite improvised weapons in Clear’s Silat are the other attackers.